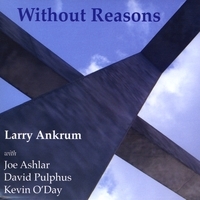 Allaboutjazz.com has just featured a free download of the title track from Larry Ankrum’s album, “Without Reasons”! Joe Ashlar can be heard playing piano on the free download as well as the entire album. The band is rounded out by David Pulphus on the Upright Bass, and Kevin O’Day on the drums. Click here to read more about the album and download the free track! Thanks for listening!